Father Brian, congratulations on the canonization of Mother Teresa. I’d like to talk with you about her “dark night.” Can you tell us how that first came to light? Thank God the Jesuits had the foresight to save those documents! They were mostly from Father [Celeste] Van Exem, her spiritual director in Calcutta during those years of the inspiration and following. Plus Archbishop Périer, the archbishop of Calcutta, who was also a Jesuit, and then the Jesuits who came later—Father [Lawrence] Picachy, later Cardinal Picachy and then Father [Joseph] Neuner. They saved the documents. We didn’t realize they were there until the work began of collecting the documents, even before the actual process began. When we checked the archives of the Jesuits in Calcutta and the archbishop’s house in Calcutta, the letters came to light. These letters became part of the process itself, and once that happened, it was only a question of time when they would be revealed—either now or, say, 50 years later, when archival material is revealed. But one of the nine theologians who looked at the positio—the life, virtues and reputation of holiness—suggested they be published. Actually, the archivist of the Calcutta Province used some of them in an article in Review for Religious, and Father Neuner had also written something, using some of it. So I thought the best thing would be to give all of what we had on the darkness. So Come Be My Light has everything, minus one or two letters that came after. She had never spoken to you about these experiences, is that correct? That is one thing that she never spoke about, and very deliberately. The sisters, or even I, would ask about the “inspiration”—Sept. 10 —and she would say nothing; only if the pope in obedience told her to say something. It was so sacred to her. So she managed to be a very public person yet at the same time was able to keep this experience hidden. Father Van Exem told one of the Jesuits in Calcutta, who told one of our priests that Father Van Exem had five boxes of materials. Mother kept pressuring him to destroy all those things. Now I’m sure that her perspective is different! 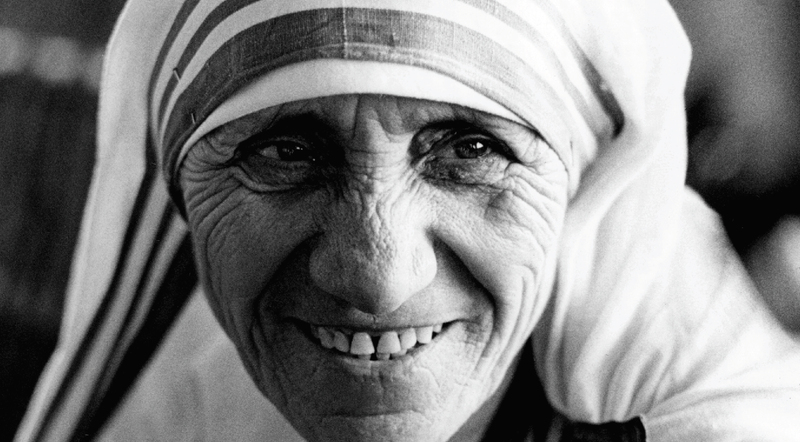 Thankfully, they had the sense to keep those, because they reveal a very important part of Mother Teresa’s own holiness and an important aspect of the Missionaries of Charity charism. We want to be in solidarity with the materially poorest of the poor, but when she came out to the West, more and more she would say that the greatest poverty in the world today was to be unloved, unwanted and uncared for. And that was her own experience. Paradoxically, she was so united to Jesus that he could share with her his greatest sufferings in the Garden, and the sense of abandonment on the cross, as other saints had. The unique part of that darkness connected to Mother Teresa is this. St. Thérèse’s experience [Thérèse of Lisieux] was more in the context of a trial of faith. And in the late 1800s and early 1900s that was the big question—of faith and the meaning of atheism. But this modern poverty of being unloved, loneliness, which Mother Teresa was experiencing, that is a kind of spiritual poverty as well. Could you describe the kinds of mystical experiences that began her ministry? Be careful what you promise Jesus! As you understand it, these locutions were auditory, which is rare in the lives of saints. Is that accurate? They were in the imagination. They weren’t external, like an apparition or anything. But they were very clearly and distinctly not part of, say, her morning meditation. Even she called it “the voice.” She said it was very clear, very distinct. The dark night comes rather soon after her ministry begins. As far as you know, because it is somewhat unclear in Come Be My Light, that lasted until her death. Is that your understanding? That’s my understanding. There’s one moment that’s been recorded in the book, in 1958, when Pius XII dies and, like we still do when a pope dies, the bishop will have a Mass praying for the repose of his soul. At that Mass, Mother Teresa asked for a sign that Jesus is pleased with the work of the Missionaries of Charity. And at that moment, the darkness is lifted. She simply says that Jesus simply gave himself to me to the full—although the union, the sweetness of those six months, passed much too soon. Which brings me to a question I’ve always wanted to ask you: Do you think possibly that her early formation, in a sense, encouraged her to privilege the interior movements over the exterior signs of God’s presence? Because when I read the diaries and letters, I sometimes want to say to her, “Are you looking outside of you?” Is there a sense of that? So she’s united with him more by will than, say, by pure faith. She sees all around her the whole work is spreading, it’s growing. She’s seeing the fruitfulness of it, and she sees people reacting. She’s seeing the generosity of those who are helping her. So for her, that also has to be God’s presence, and God’s work. So she does see that. On the other hand, I’ve always wondered that maybe her mystical experiences early on were so beautiful, she simply craved them again, as anybody would. Strangely, people have said, “Who were the spiritual directors, and why weren’t they helping her more?” It wasn’t until Father Neuner in 1961 gives her an insight and says, “This is a spiritual side of your work.” So that lights the bulb, as Father Neuner said later on. So that helped her. It was still painful and difficult, but at least she had some meaning to it, to be associated with Jesus’ own suffering, and interior suffering especially. She used to comment that she thought Jesus suffered more in the Garden than in the physical suffering on the cross, and now we have an idea why she was saying that. Thank God for good spiritual directors. For me, all this vaults her into the category of one of the greatest saints ever, because the other saints did these great works with the poor but with consolation. Right. We around her would think, “It’s not easy being Mother Teresa,” with the demands—even on an airplane people are approaching you, wanting to talk, asking for a signature or a blessing. So you would think at least she’s enjoying this rich interior life to keep her going. And then we find out the opposite. It’s astonishing. I like what you said about her being a model for today. It’s interesting that God would give her the graces that were needed for today but also invite her into the suffering that many people today are suffering. We know that saints are raised up for a particular time, for the times in which they are living. So that’s one of the reasons why Mother had that experience. Was it because of such a widespread phenomenon, this way of spiritual poverty? Even if you’re materially rich, or in any class of life, it is a really common experience of modern life. We go so fast, and family life isn’t the same, so it is much easier to have that kind of experience of loneliness, of being unwanted and uncared for, seemingly. By way of closing, can you tell us what it was like to be with her, what she was like personally and what she meant to you? Well, I knew her in the last 20 years of her life, so I had the more mellow version of Mother Teresa! [Laughs.] At the beginning, she was always very demanding, of her sisters especially. But what was really striking was how really motherly she was. Everyone who knew her even briefly would call her Mother, and the sisters would call her Mother and so to all the people close to her she was just Mother. She really wanted to be that maternal presence—that’s one of the striking things. The other was just how ordinary she was. Sometimes, if you didn’t know what she looked like and you were in the convent, she wouldn’t be sticking out in any way, unless you noticed how she would do those little things, like a genuflection or taking the holy water when you enter—the little things that you could say was a special way she did those things. She was a realist saint with her feet on the ground, very practical, very observant. You couldn’t get anything past her. At meal times she would notice what sisters were eating, what sisters were not eating, what was said, what kind of mood you’re in—she was very observant! Can you describe your feelings about the upcoming canonization? Humanly speaking, one thing is a sense of satisfaction that it’s happening after these years of working and waiting. But I think the more positive thing is that now throughout the whole church Mother can be more formally prayed to—public veneration, we say. So now even stronger, her example, her message for our own time, can be even greater, stronger, more widespread. So that mission will continue. And that will continue even more strongly now. Fr. Martin, thank you for this great interview with Fr. Brian. I too was privileged to know Mother Teresa through her lay association, the Co-Workers. My time with Mother, from my first visit to Calcutta in 1981 to my last encounter with her at a meeting in Antwerp in 1993, made such a huge impact on my life. I learned at the age of 24 how faith and action have to work together. Mother instilled that in me at an early age and it has informed everything I have done since then. Even in her darkness she was a bright light to so many of us. I'll be eternally grateful to Mother for helping me to form my life around loving service to the poorest of the poor. I, too, am confident that in her death she will touch many more people, not just the hungry and homeless, but those who lack loving kindness in their lives. She will be the saint for all people who struggle with loneliness. Greetings to Fr. Brian. I haven't seen you since the 10 year anniversary of Mother's death at St. Vincent's in Latrobe, PA. This is very helpful to me because I've had a hard time understanding Mother Teresa. On the one hand she was doing all this profound work with the poorest of the poor, and on the other hand, as a person, she seemed so bland, almost grumpy. I knew an American girl who joined (for awhile) the Sisters of Charity of Mother Teresa and worked at the hospice in Haiti. I visited that hospice as well. Mother Teresa had been there to visit and I asked her what she was like. Well, she said, Mother came into the kitchen and tasted the milk and said "it is sour". That's all? That was all she had to say about Mother Teresa's visit. Knowing of the inner/outer dimension of Mother Teresa's journey, and of her own spiritual darkness and dryness, helps me to know her better. She certainly wasn't faking piety. It also makes sense to me that she was unable to "see" (and know inner consolations) because of the nature of the outer work that she was immersed in. She dared to enter a very sacred space. She made a bridge between the inner and the outer. My oldest Daughter, Mara, who graduated from St. Mary's College in South Bend, Indiana, spent her sophomore year in Rome. While there, the chaplain of her program took her and any of the other young women who chose to go to attend morning prayer and Mass at the Mother House of the Missionaries of Charity. Mara remembers getting there a bit sleepy; after all, the prayers started at 5AM. Mother Teresa prayed quietly and devoutly with her Sisters. After the Mass, Mara and her fellow students were introduced to Mother Teresa. Mara describes her with one word--joyful!! With true interest, Mother Teresa asked each student about where they were from, their studies, etc. She encouraged them to be close to Jesus always and gave each of them two miraculous medals, one for each of them and one for someone in need. Also Mara describes Mother Teresa making jokes and being incredibly lively in her gestures and constantly smiling brightly. She was not the pensive, dour person that Saints are depicted. So, despite the darkness that enveloped Mother Teresa in some ways, she was still following the advice she described her confessor gave her when as a young girl she shared with him she was considering entering the spiritual life. He told her, "Only do it if it brings you joy." Mother Teresa is truly the embodiment of Psalm 139, where we learn that for God “Light and darkness are the same.” Reading Fr. Martin’ s questions and Fr. Brian’s answers in “Saint Of The Darkness” was like taking a spiritual stimulant, spoon after spoon. I focused best on Fr. Martin’s remark, “Be careful what you promise Jesus.” It might happen! Then what? The following is a true example of the “What?” Years ago in much younger times, having a wide ranging converse with a priest friend, he said to me, “Be careful what you say to God. The answer may shock you!” Then he explained how as a youthful seminarian filled with an enthusiastic response to the Spiritual Life, he offered himself as a “Victim Soul” ready to offer everything to God in union with Jesus on the Cross. How well I know that prayer too, but this isn’t about me! Subsequently ordained and ministering successfully as a priest into at least his late forties, suddenly he was struck down with a type of mental illness, crippling mental depression, and his personal “Victim Soul” experience commenced, many years after his initial offer to God. His Superiors placed him in a mental hospital for treatment which included Shock Treatment that sent powerful electric surges through his body, strapped to a table to prevent flying off the treatment table. And other humiliating treatments too. But even worse was yet to come! Sent home Father was subject to additional extremely painful victimization hammered in by the hushed comments and gestures of his confreres indicating that he was a “coo-coo bird” not fit to be trusted and often excluded from conversation! But he soldiered on, years later returning to the Lord, who awaited his arrival with a great big hug and the words, “Well done!” He surely must have felt like Mother Teresa in her Darkness, unloved, unwanted, uncared for. Community life for him had become one with the Cross and as he said, “I asked for it!” For decades Mother Teresa “ran on empty” the tires of her life grinding away, but never tiring of association with Jesus in the Gethsemane Gardens of her life, having no doubt many “invisible bloody sweats” as she knelt in prayer walking, comforting human misery. She’s now sharing Glory with my priest-friend, both of them “living it up” as never before! Yes, be careful what we ask for. It may come in very surprising ways! Adding as an addendum I'd like to say, of course in God's sight everyone is special, each "called by a name known to God alone." But because Blessed Teresa will be canonized on September 4th, I feel particularly blessed. Why? Because September 4th is my Birthday, my 85th Birthday! I feel gifted that attachment to Teresa creates, for me a significant linkage, please God filled with many high fives together, blessings on my family, friends and me. I am pretty sure Mother Teresa would refuse the title "saint" if she were asked her opinion. I think she would consider the poor and homeless the "holy ones of God". Dorothy Day, when referred to as a saint, responded, "“Don't call me a saint. I don't want to be dismissed so easily. ” The People of God want to focus on Jesus, and The Way, the Beatitudes, which are hardly ever referred to. "Blessed are the humble" doesn't include being called a "saint". Perhaps the highest form of Christian altruism and love is to continue doing good without recompense. It must have felt like a very long and lonely journey to Saint Teresa of Calcutta because of her lack of actually feeling Christ beside and within her. This is the type of heroism rarely seen, and I am thankful she lived in our time and taught us to expect nothing but know that everything is possible. This article also appeared in print, under the headline "Saint of the Darkness," in the August 29-September 6, 2016 issue. James Martin, S.J., is editor at large of America. The 10th anniversary edition of his book My Life With the Saints will be released in September by Loyola Press.